We have an absolutely amazing giveaway for you all today! Julia from In Or Out Media has generously offered one of our readers a $30 gift certificate with free shipping! You are going to love this! I know I do! Julia was so generous that she sent me this print. And I absolutely love it! To tell you the truth, I kept it in the packaging sitting on my kitchen counter for a few days because I thought it was so darling! Don't you agree? Here is what it looks like in my frame. I spray painted the frame an aqua color and I can't wait to hang it up in our office! 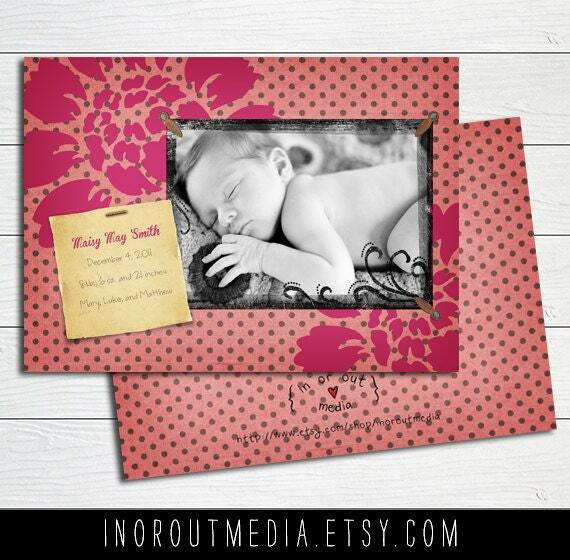 In Or Out Media has pages and pages of designs that you can choose from on their Etsy page. And everything is just so cute! 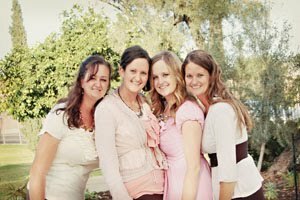 Since I am having a girl in about one month, I was looking at the birth announcements for girls and I love all of them! And she has pages of Valentine's Day Cards, with such a great selection for boys! 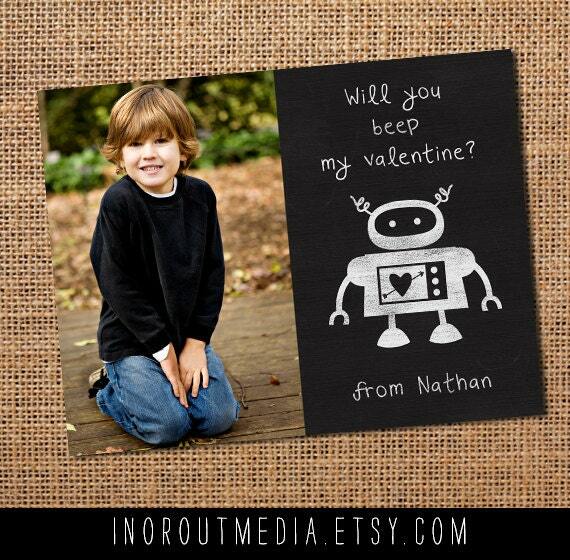 But don't forget to order your Valentine's cards by February 7th! If you want to check out an amazing selection of Wedding Invites, then look no farther! You can even ask Julia to change the color, font or wording to suit your style. The cardstock is great and your print will look amazing! "I started In or Out Media in 2012 as a way to get back to my graphic design roots. I'm also a photographer and started designing my own templates for cards for customers, then it just snowballed from there. I actually set out to be a designer, have a degree in graphic design and everything, and then got derailed by marriage and kids, and somehow wound up being a photographer. ;) I am a homeschooling mom to 4 blessings, our baby girl being special needs (she has Russell-Silver Syndrome). 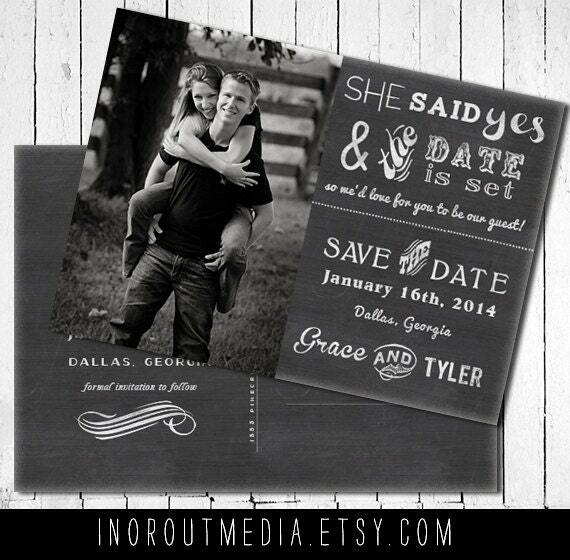 I offer custom save-the-date cards, wedding invitations, announcements (of all types - wedding, birth, etc. ), shower invitations, and more. I have a lot of designs to choose from in my shop, but I also welcome custom orders and modifications to my designs to make sure everyone gets exactly what they want." And Julia is offering our readers 10% off anything in her shop. Just use the code "BABBLE"
Disclosure: I received the products for this review. All of the opinions expressed are 100% mine. Valentine's Day is so much fun! My daughters and I decided to do a little project with pink paper. Their favorite color is pink, so they were so excited and asked me everyday for a week when we were going to use that paper! My husband cut a 2x4 into various sizes and he even sanded it for me! (The largest block is 8 inches tall.) It was so nice to have his help. He works a ton of hours being a OB/GYN resident, so I love it when he is home. I painted the blocks white and then we mod podged the paper onto the blocks. For the letters and hearts, I used my Silhouette machine. The font I used was a one I downloaded called LoveNessTwo. My daughters loved putting the vinyl on! We finished it off with some bakers twine. Such a fun project and looks so cute in my front entry way! Hey Everyone! I have a little announcement that I am SUPER excited about! Our family is going to be moving from Amarillo, Texas to Mesa, Arizona!! I have not lived close to family since I got married, so I am really excited! My children are also excited to live a lot closer to their cousins!! Mesa, Arizona- Here we come!!! Years ago, my family lived a few houses down from an amazing family! My kids were little then. I had only my five boys. And my boys loved their kids. They would talk about them all the time. Every time we would pass their house, which was all the time, my kids would look out the window to see if they were outside. The father of this family is a Chef. And an amazing one if I do say so myself. His name is Chef Brad. When we moved away from that neighborhood, Chef Brad made our family dinner as we were packing. And I will have to say that he made the most amazing salad I have ever had! Even to this day, my husband jokes about me eating the whole thing. And the salad was huge. In my defense, I only finished eating it when everyone was done. :) And I still have cravings for that salad even after seven years! My husband stopped by their house one evening and Chef Brad just made brownies. He gave my husband one and when he came home that night, he couldn't stop talking about them! He said that the brownies tasted like he was in heaven! He teaches people how to cook with all different types of grains. Grains that I have never even heard from! And he can make everything taste so delightful! And he also has a cooking show on BYUtv called Fusion Grain Cooking. The reason I am telling you all this, is because he has recently started a blog called Third Sunday Dinner. He shares recipes, stories and tips. The most recent post he did is on Lemons. 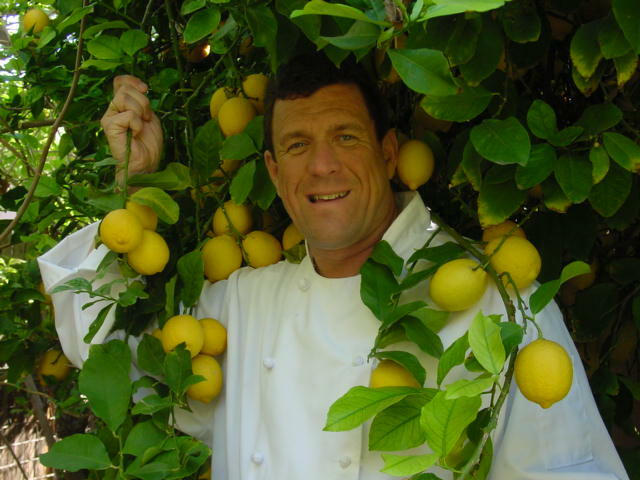 He talks about all the health benefits of lemons. It's very information and you don't want to miss it! So head on over to Third Sunday Dinner and check out everything Chef Brad has to offer and you will be wishing that you are neighbors with him too! Last year I made a Valentine Banner with my Silhouette. Since I moved this past year, I had to find a different place to put it. There were two places that I was considering. The first one was my front entry way (which is the one that I chose) and the other place was my fireplace mantel. I'm still in the process of decorating it. I want to cut some vinyl and put some more Valentine decorations up, but it's a start. I love reusing decorations and especially banners that take a long time to make. Now to center all my decorations around my banner and it will look fabulous! One of our most viewed posts of all time is our Homemade Mod Podge. Now this recipe isn't ideal for every crafting project, but it is a cheap and simple alternative. Recently, one of our readers emailed us a few pictures that she took of a dresser she redid using the Homemade Mod Podge. I thought that the results were too amazing not to share, so I asked her if I could share her pictures and story with all of you. And I was so excited when she said yes! This is what Jennifer said: "I found your mod podge recipe on pinterest recently. 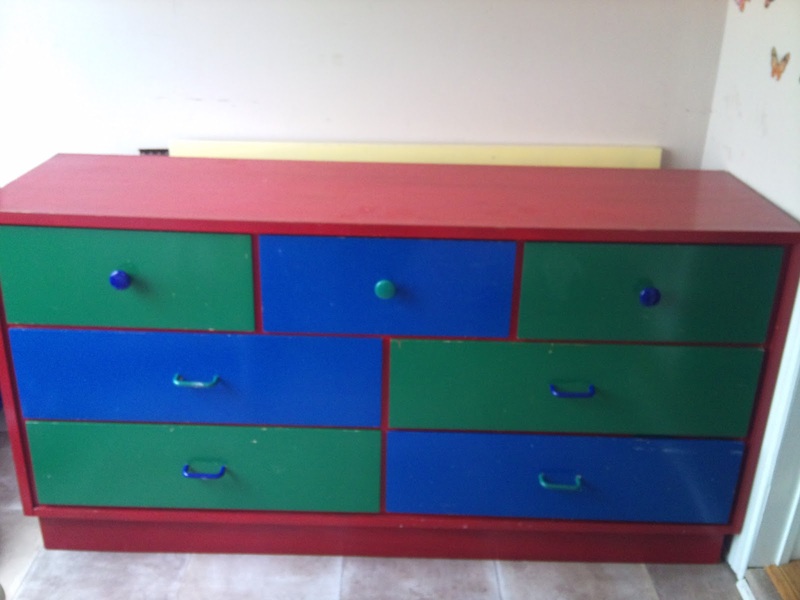 A week later my cousin gave me a colorful and sturdy dresser for my 7 year old, self proclaimed, fashionista...because she keeps outgrowing her dresser! 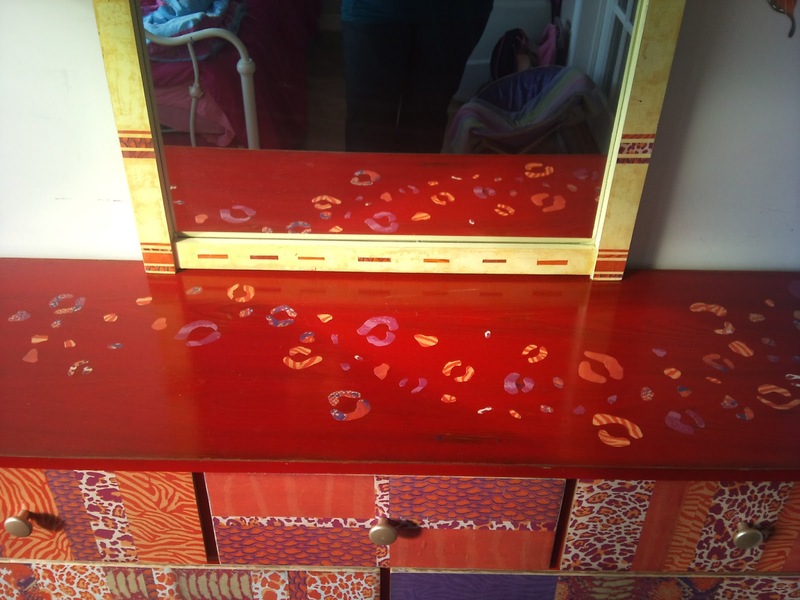 She asked me to paint her dresser purple ...but I really did not have the room, or money to devote to the project. 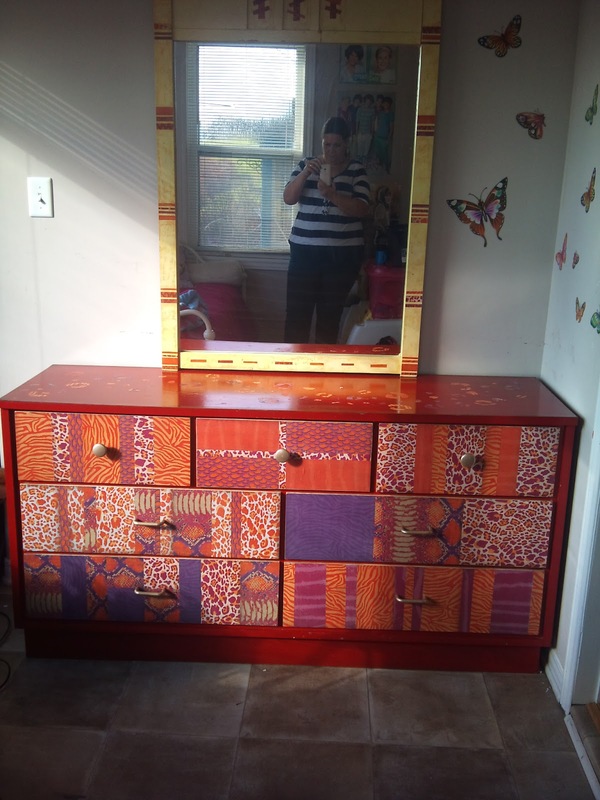 I picked up a huge damaged paper pack at Michael's a couple months ago for a sweeeet price that would really make this dresser wild and I thought that it would be a fantastic time to try out that mod podge recipe. So on a Monday morning after I got the kiddos on the school bus I started measuring drawers and paper and cracked out the ole calculator (I haaaaaate math). I cut up my paper and layed it out onto the drawers, (to check my measurements....not to shabby) sanded the surface slightly and started mod podging. I distressed the mirror using some shimmer spray in the color sunflower, that I had in my scrap-booking kit, and added some paper scraps and a light sprinkle of glitter while the mod podge was still wet. 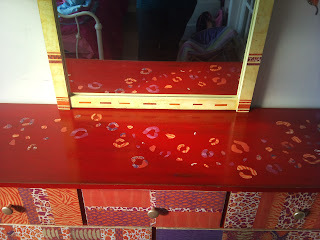 Next I cut out some leopard print shaped and mod podged them to the top of the dresser in a swirl pattern. My dad painted the knobs and pulls a nice golden metallic hue. I sanded the edges of everything and this is the end result...My girlie just loves it! In total I devoted about 8 hours to the project and spent about $10. I also gained a new addiction to add to my growing list of crafty addictions...decoupaging!" Didn't Jennifer do an amazing job? Thank you so much for sharing. We had a reader ask if the Homemade Mod Podge can be used as fabric Mod Podge. I haven't tried it with fabric. So I thought that I would ask you all. Have any of you tried it on fabric? And how were the results? Thanks! You are all awesome! Do you love to read? I know that I love a good book to read at night after all my kids go to sleep and even during the day when I can sneak a minute or two. If this sounds like you, then this is the perfect giveaway for you! We are teaming up with many other bloggers in Tip Hero's latest giveaway to offer a $150 Barnes & Noble Gift Card to the lucky winner! The giveaway begins on January 16 and will run for two weeks. It will end on January 30. It is open to the United States and Canada, ages 18 and over. Enter below for your chance to win by filling out the PromoSimple form below. And come back daily for more opportunities to enter. Good luck! We are also excited to announce the winner of our Little Gems Creations Giveaway! The winner is.... #242 - Ashley Ponder Richards! I will email you, if I don't hear a response within 48 hours, a new winner will be chosen. Thanks to all who entered! And for those of you who didn't win and would love to buy something...take a minute to stop by and visit Little Gems Creations!!! She wanted purple cupcakes. So one of my boys made the cupcakes. He did a really good job. He added purple food coloring to a white cake mix and then made a purple cream cheese frosting. A few purple sugar sprinkles and edible white pearls topped it off! And if you are interested, here are a few cupcake tips when using a cake mix. So here is my sweet 2 year old, Daisy May. She is growing so fast and will seem so big when the baby comes next month! And just on a side note, she got her ears pierced yesterday and loves her new earrings! We had all of our family together during Christmas! 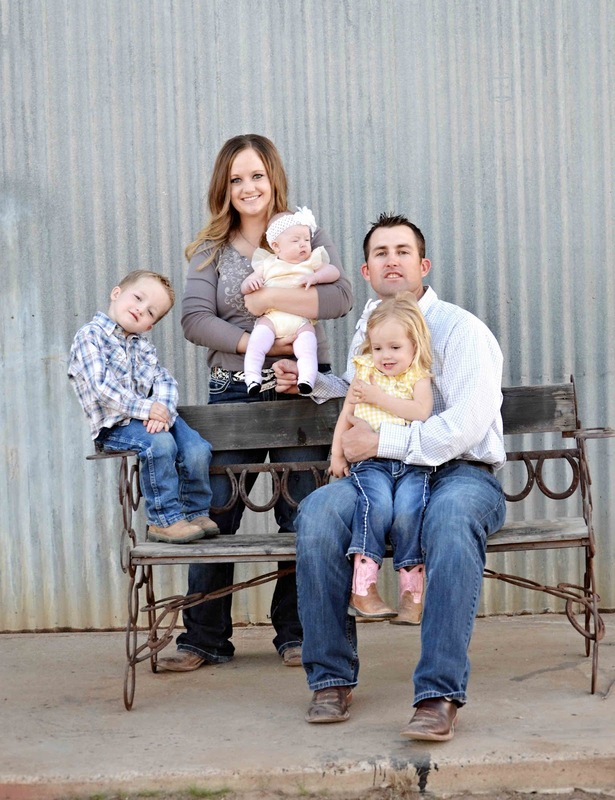 It does not happen too often, so we took a family picture. We would like to share with you! Here is our family with all of our children! Briana has 7 children expecting number 8, Brittany has 6 children, Bridget has 4 expecting number 5, Brooke has 3 and we also have a brother with 2 children. 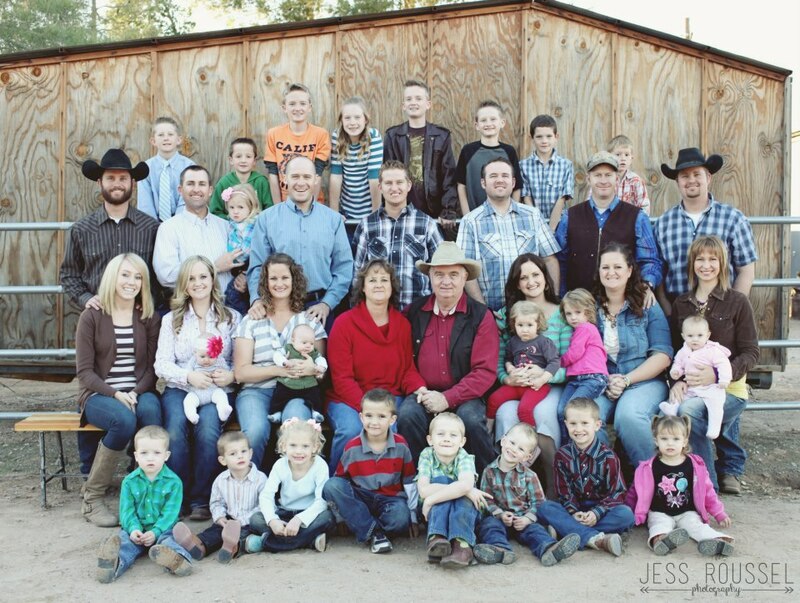 There is going to be a total of 25 children and the oldest are only 12 years old! We LOVE when all of us are together! We have some GOOD and LOUD times! Thank you Jess Roussel for taking our pictures at the last minute!!! For Christmas this past year, I kept really busy making quilts for two of my sons. One of my boys wanted a Jean Quilt and has been asking for months. So I kept putting him off and worked on it while he was at school. You should have seen his face when he opened the present Christmas morning! It was priceless! I did this quilt a little different than the last one I made. About a year ago, I made a Jean Quilt for my husband. My mom and sisters helped me tie the quilt. This year, I didn't have my mom or sisters around to help, so I decided to machine quilt it. And I love how it turned out! I started making the quilt by cutting the jeans into strips. The length of the strips varied depending on how long the jeans were and where the holes were that I had to cut out. The width of the strips were 4, 5 or 6 inches, depending on how wide the jeans were. I divided them into piles and then sewed the piles of strips together into long rows. Then I sewed the rows together, alternating the different width of rows. I used another quilt that I had to get the dimensions. He wanted to fit it onto his bed. Now it's time to put the quilt together. I bought some fabric and sewed it together to make the backing, I believe that it was about 5 yards. The last jean quilt I did, I just used a flannel sheet. My son requested a John Deere Jean Quilt, so that's what he got! First, put down the back of your quilt on the floor, then the batting and then the jean part. So you have a sandwich of a quilt. Smooth out the wrinkles and use curved safety pins to pin all over the quilt. The safety pins will hold your quilt into place. Now is the time for the sewing machine! Above is a picture of the curved safety pins and the walking foot that I used. I went to a local quilt shop and bought a generic walking foot. They made sure that it would work on my machine before I bought it and it cost about $20. The walking foot feeds the top layer of your fabric so it doesn't get all bunched up. I sewed down the quilt in straight lines. But I didn't "stitch in a ditch" because I didn't want to break any needles. So I stitched about 1/4 of an inch away from each seam. When machine quilting, it's best to start in the middle of your quilt to avoid bunching and tucks in your fabric. And believe it or not, I only broke one needle the entire time by working on this quilt! And it was my own fault, because my needle was loose and I started sewing, which caused it to break. My son's name is Ashton and he wanted the letter A on his quilt. So after I bound the quilt, I cut out the letter A and sewed it on. As many of you know, we LOVE boutique baby items! We love everything about them! 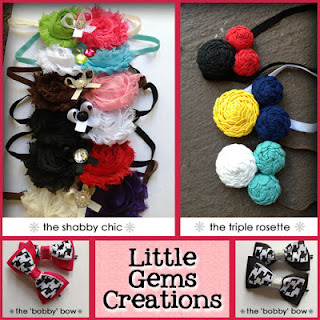 We were absolutely thrilled when Little Gems Creations contacted us about doing a review & giveaway. It was SO fun because Little Gems Creations sent us all different headbands for each of our little girls! The girls had a blast taking pictures of the headbands! This headband had a Navy and Red Shabby Chiffon Flowers with a Yellow Ribbon. It was SO adorable and reminded me of Snow White! These Hot Pink Bobby Pins Bows are perfect for pig tails! My little girl was sent this Double Rosette Headband with Buttons. I would have never thought putting buttons on a headband, but I LOVE it!! And so does my daughter! The last one we received is this Purple and Pink Shabby Chiffon Headband with Jewels on it. My little one wore this headband to church on Sunday and she got SO many compliments on it! Little Gems Creations is going to giveaway 2 Headbands of the winners choice and also either the Hot Pink or Black Bobby Pin Bows. So the winner will win 3 items!! Little Gems Creations is also offering the readers of Babblings & More a 15% coupon code during the giveaway!! The coupon code is GEM15!